Viparitani means “just the opposite.” Arjuna is saying, “I have come here to fight to regain my kingdom, but actually I am seeing it is just the opposite.” Why? Because one works hard and tries to become rich man just to show off: “Just see how I have become rich.” This is the psychology. Nobody is working hard for serving krishna . This is maya. And krishna consciousness means we will take the same hardship, but for krishna . This is mukti, or salvation. We need not stop working. We simply have to change the position. In family life we work uselessly for so-called relatives, but when we employ the same labor for the service of krishna , every inch of it is utilized. Govinda dasa, a great poet has sung, sita atapa bata barisana e dina jamini jagi re, biphale sevinu krpana durajana, capala sukha-laba lagi re. He says, “I have worked without caring for scorching heat and severe cold.” Actually people work so hard. Whether there is snowfall or scorching heat, a person has to go to work. Somewhere it is severe cold and somewhere it is scorching heat – this is nature’s law. While you are in a cold country, you think that “India is very warm. They are very happy.” And in India they think, “In England they are very happy – it is so cold.” This is illusion. Nobody understands that there is no happiness within these three worlds, beginning from Brahmaloka down to the Patalaloka. Abrahmabhuvanal lokah punar avartino ‘rjuna (Gita 8.16). There is no happiness, even if you go to the Brahmaloka and get the opportunity of living like Brahma, millions of years, and thousands of times better standard of life. They do not know it. Janmamrtyu- jara-vyadhi-duhkha-dosanudarsanam (Gita 13.9). Therefore our aim should be only how to go back to home back to Godhead. When we are materially conscious, we are absorbed in the thoughts of “me, my family, my society, my country, my community . . .” This is expanded selfishness. Initially it begins with our own self. Just like a child – it does not think of anyone’s happiness. Whatever he takes, he wants to eat. As we grow, we expand our happiness little more: “My happiness, my brother’s happiness, my family’s happiness, my community’s happiness, or my nation’s happiness.” So you can go on expanding the scope of happiness, but there is no lasting happiness. Foolish persons do not understand this. Here Arjuna is playing the part of an ordinary foolish person. “I came here to fight, to get happiness, and I have to kill my own kinsmen. Then where is my happiness? I cannot enjoy the property or the kingdom alone. There must be friends and relatives. I will be very proud: ‘Just see how I have become king.’ So if they are going to die, then whom I shall show my opulence?” This is the psychology. 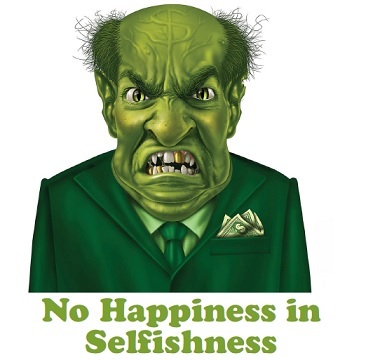 There is no happiness in selfishness, either individual or expanded. Mahatma Gandhi had thought, “Let the British go away. My countrymen will be happy.” But when the British left, giving the responsibility of Indian empire to the Indian people, Gandhi was thinking, “Oh, I am so unhappy.” He wanted Hindu-Muslim unity, but the country was divided. He wanted that the government should be very simplified, but he saw that his followers were after comforts and luxurious offices. Therefore he thought, “Only death will please me.” And the next day, he was killed. attached. Sukhera lagiya, e ghara bandhinu, agune puriya gela: “I constructed this nice house for living happily, but there was fire and everything got finished.” This is the way. You construct everything for happiness, but there will be something which will put you into the most miserable condition. This is called the material world. Therefore an intelligent person, “If working so hard for material happiness is going to give me the opposite, why not work for krishna ?” Constitutionally, every living entity is a servant – jivera svarupa haya nitya-krsnera dasa (Cc. Madhya 20.108-109). If he does not serve krishna , then he will have to become the servant of maya. His servitude will not go. If you don’t become the servant of krishna , then you become the servant of your wife, children, relatives, country, or your dog. At last, if you have no family, then you become the servant of your dog. His dog passes stool, and he is waiting: “Yes, sir. You pass your stool, I am waiting.” This is nature’s way. So we remain servant of maya on account of our sense gratification. I serve my wife or husband because I want to satisfy my senses. Here is the disease. So actually, instead of becoming master, we become servant. Kamadinam kati na katidha palita durnidesah: Servant of lust, greed and all senses. While serving our senses, we have to execute so many abominable things. Your master may say, “You have to do it,” but your conscience may not allow you to do it. Still, you have to do it. A many may not like to steal, but out of need for money, he has to steal. When I become a servant of maya, I am obliged to do abominable things. And the result is that nobody is satisfied. A devotee once prayed, “My dear Lord, I have served my senses for so long, but they are not kind upon me. They are still dictating, ‘Do this, do this, do this.’ Now I have got intelligence by Your grace. I have come to serve You. Kindly engage me.” This is surrender. This is called vairagya. In human life, we should get this intelligence and vairagya not to serve this material world, but to serve krishna . The Mayavadi philosophers simply stop these material activities. Even the Buddha philosophy nirvana, or stopping material activities. But what do we do after stopping? Everything zero? That is not possible. This is their mistake. The Mayavadis are of two kinds: the impersonalists and the voidists. Their philosophy is good so far, because a foolish people cannot understand more than this. If a fool is informed that by serving God you can enjoy a better life in the spiritual world, he will think, “Oh, I suffered so much after serving in this material world. I can’t serve anyone anymore.” As soon as they hear of service, they think of their service in the material world, which is miserable. For example, a diseased man lying on the bed is highly miserable. For a long time, he has not been able to eat or walk properly, because that gives him great pain. If you tell him, “Once you get cured, you will be able to eat nicely and walk properly,” he shudders at the thought: “Again eating? Again walking?” He can’t believe how eating and walking can be a pleasurable experience. Similarly Mayavadis cannot imagine how service to krishna awards us ananda. Serving krishna is simply pleasurable and blissful. One becomes eager to serve Him more and more – that is the spiritual world. Those who cannot understand this become impersonalists: “No. The Absolute Truth cannot be a person.” The Buddhists make everything zero, and the Mayavadis make everything impersonal. They do not understand that a life dedicated to serving krishna is blissful. Arjuna, playing the part of an ordinary man, thinks that his action – killing his friends and relatives – will make him miserable. He does not realize that krishna wants the battle to happen and Arjuna should assist Him. This is what will make Arjuna happy. This is the position in the material world. 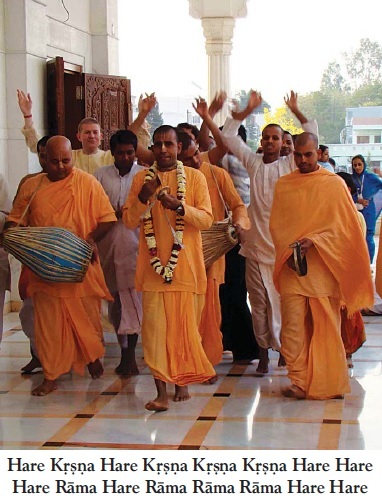 We are always in problem, but when something better is proposed to the materialistic person – “You take to krishna consciousness, and you’ll be happy” – he sees nimittani viparitani, just the opposite. “What is this krishna consciousness? How can this make me happy? My family is in trouble or I have got so many problems. How will krishna consciousness help me?” This is the material condition of life. Therefore it requires a little time to understand.